OSRS Mobile is now Live! Old School RS Mobile is Live! As of October 30, 2018, you can now play Old School RS on Mobile, with both IOS and Android. It’s the full version of Old School Runescape, so any existing account you have can log into the game and continue playing. You will be playing the same worlds and areas as people playing on their computer. This means you can continue training skills on your main character using your phone or tablet. Goodbye life! Since the OSRS Mobile launch, the population in game has absolutely soared. Average players online is regularly 100K+ for Old School RS. It has more than doubled since the release of mobile. 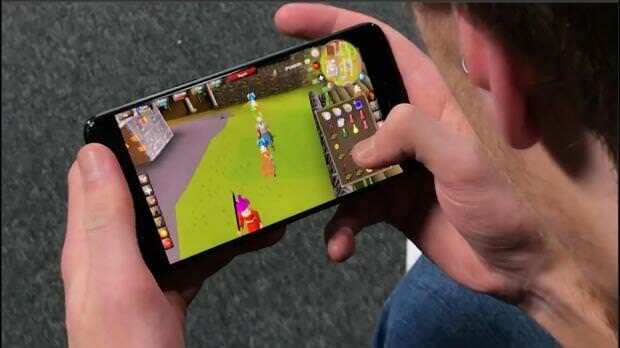 As more and more new players start downloading the Runescape application on their phones, it is possible this growth could continue into the future. Old School RS adapts very well to mobile, since many of the actions players take in game are fairly simple and non-complex. Games like Fortnite have shown that even complex gameplay on PC can be adapted well onto mobile. We might not suggest high risk PKing or soloing GWD on your phone, but training skills like Cooking, Woodcutting, Mining, etc. are all perfect for when you’re just hanging out on your phone. Even if you’re playing on your PC, sometimes nature calls. Now you can sit on your toilet without your time going to waste. For the most part, the game plays exactly the same on mobile as it does on PC. For that reason, there are no “mobile” and “PC” separated worlds. Everybody plays together no matter what device they are using. That means your levels, your bank, your friend list, everything is exactly the same on your account, no matter what device you use to log in. Aside from re-learning a few of the mobile gameplay and user interface tweaks, the commands are virtually exactly the same. If you have already played Old School RS, then you will pick up OSRS Mobile in a matter of 15 minutes. Even new players will have no trouble figuring out gameplay on their phones or tablets. A lot of people are asking us if we sell gold for RS Mobile. The simple answer to that question is: yes! OSRS Mobile, as mentioned above, is the same as regular Old School Runescape. You can buy gold from us just as you would on your PC. Simply navigate our website, add the amount of gold you’re looking to buy to your cart, and checkout on our site. Then you’ll want to use our Live Support after you purchase to arrange delivery. Check out our Buy OSRS Gold on Mobile Page for more information. Our chat system is more optimized for your PC, but it still works fine on mobile. It can be slightly difficult to navigate between our chat and the OSRS Application on your phone. You’ll need to swap back and forth between your browser and your OSRS Application at delivery. If you have any problems just let us know and one of our agents will assist you. We’ve delivered many orders already to Mobile users, and we’re excited to be able to support gold purchases on all your devices. R2Pleasent Gold prides itself in providing OSRS Gold at the cheapest rate. If you find any other website selling gold at a cheaper price, let us know so we can beat it! Even with the huge demand from Old School Mobile, we have kept our prices incredibly competitive and we make sure that our stock is always 1 Billion+. Right now the price of gold is just over $1.00 USD per Million. Runescape 3, otherwise known as RS3 will also be released on Mobile in the coming months. Keep an eye on Runescape.com and follow their announcements closely. We expect a release date of approximately Q1 2019. We believe this release will also reinvigorate the RS3 community. Mobile is just a win-win for everybody.